The cat’s out of the bag! For long the European car manufacturers have dominated the medium-sized premium car sector though I suspect that for the past couple of years or so Honda’s Accord Saloon and Tourer models have been increasingly nibbling away at their status. Now after a week’s experience with the 2.2-litre Accord saloon I suggest it is time for buyers in this market to wake up, not simply to take Honda products on their reliability credentials but to discover the product quality, the more than competent driving performance and, in particular, the impressive styling. Believe, you me, I had five separate groups of Jo Public confronting me to ask about the test car, one actually twice for extra information as he had never heard of the car and was looking for a quality car to replace his two cars as he joined the ranks of the retired. Reliability was one of his major priorities…just check the Accord’s CV. 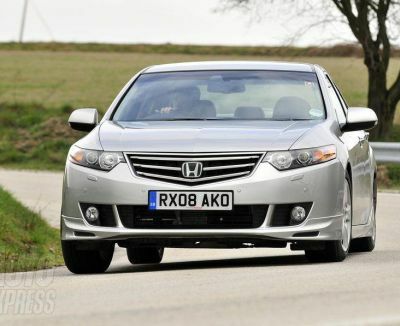 Launched on the UK market in mid-2008 and replacing a previous Accord, this is a virtually all new design and, even though the engine range may be similar, an immense amount of development and improvement has been carried out, notably on the diesel engine as tested. Yes, there is a steadily growing choice of diesel automatics on the market and this one comes with an option of either a 5-speed manual or, as tested, a 5-speed automatic unit. This has been able to come about by the power and refinement advances now achieved by modern diesel engines (the test’s car’s 2.2-litre unit is quieter and more refined than I recall with previous Honda diesel units) plus specially developed automatic transmissions that can cope with the massive torque of a diesel engine. The test car was painted in the most brilliant of reds which really made the body lines stand out to good effect though I suspect the target customer for this car would go for less indulgent silver, grey or even black. Immediately the driver’s door is opened this car screams wow factor, its draws on Honda’s racing expertise to create an engaging and involving ‘cockpit’ that combines high technology with function, excellent ergonomics and exceedingly high quality levels. There is a lot of equipment and driver services here that should not deter; learn as you go. Driver comfort is brilliant, aided by full electric adjustment of the well contoured seat, fully adjustable steering column and ideal position of the sporty alloy finished pedals. I felt as though I was wearing the car! For interior accommodation I would rate the Accord as a compact executive model, the occupants in the rear having two good sized seats with passable leg and head space. A third occupant in the rear would be feasible though hardly welcome. Luggage capacity, accessed through a shallow boot lid is better than looks first suggest and there is the possibility of folding one or both rear seats…or alternatively go for the Tourer version. The EX GT specification puts the owner on a level playing field with pretty well any premium grade car – all the usual electronic aides, cruise control, perforated leather seating (front heated), alloy effect interior trim, Bluetooth with voice recognition system, rear view camera, satellite navigation, GT aero body kit, high density headlights with washers, front and rear parking sensors and so on. Options include collision mitigation system and lane keeping assist system. Driving performance in my opinion is immensely satisfying, hardly demanding on the driver though it does not quite have the sharpness of feel of say a BMW or Audi or the softness of a Mercedes-Benz C-Class. That said it is a very competent handler with tremendous braking power and an automatic gearbox that complements the power unit to very good effect. Overall performance is very competitive, the car feels that it delivers well and lives up to Honda’s claims of a top speed of around 130 mph with 60 mph reached in a creditable 9.6 seconds. Considered with a combined fuel consumption figure of 49.7 mpg that would probably drop to a still acceptable 40 mpg under general driving conditions these are seriously competitive returns for a car of this stature. I rated the Honda Accord highly when I drove it briefly during an earlier launch exercise, this test session has been a revelation. A car well worth discovering! Mercedes-Benz C220D CDI Elegance £25,075. AUDI: The continuing move to introduce stop-start technology now includes the Audi A3 range, including diesel versions, an A3 Sportback 2.0TDI version recording C02 figures of 115 g/km compared with 134 g/gm of the conventional model. System involves a power recuperation device to replenish the battery via the brakes. LEXUS: Interest is reported to be strong for the hand-built Lexus LFA super car though Lexus report that orders can still be placed for European customers via its Lexus Park Lane dealership. Only 500 cars, allocated to 56 countries will be built based on a 4.8-litre V10 552 bhp engine. Confirmed orders/deposits will be activated this May. NISSAN: The new Nissan Cube, just on sale, is reported to retain strong residual values, Nissan reporting that the £14,000 1.6-litre petrol model will be worth 49% of new price after three years or 30,000 miles. SWAPPAGE is the new term for part exchange, at least the Toyota version. As the Government Scrappage scheme winds down, the under pressure manufacture is offering £2,000 off of the price of new Yaris, Auris and Avensis models registered between 1 March 2000 and 28 February 2003 that have been owned by the customer for the past 12 months. TOYOTA: A completely restyled Toyota Auris range has been launched with prices from £14,463. A new British-built hybrid version, the Auris HSD, will be available from July. VAUXHALL: Demand for Vauxhall’s EcoFLEX technology cars has been strong across all ranges. Top seller has been the Corsa 1.3 CDTI with 12,300 units sold in 2009.